Two of Zhou’s bottles are inscribed in clerical script (the other is in the Humphrey Hui Collection: Sin, Hui, and Kwong 1996, no. 60). 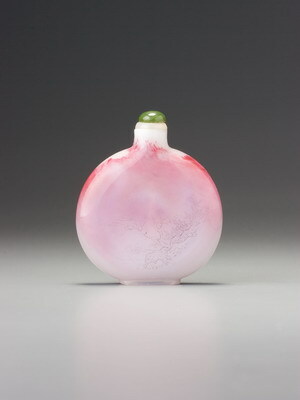 Both, coincidentally, are on much earlier, sandwiched pink glass bottles, and since the other one is the earliest known dated example by Zhou, from 1895, this may be similarly early, although we have left a broader range in case. As we noted earlier, his clerical script is no less commanding than his more customary draft script, and he was quite clearly a calligrapher with a broad range, since on a few examples he also copied ancient bronze script. It is a delightful bonus for us to find Zhou’s works on lovely early bottles rather than distinctly pedestrian white glass shapes. We suspect that he probably chose this subtle pink and white glass by virtue of the splendid effect of misty landscape it lends to his composition. It cannot have been coincidence that similar landscape paintings appear on both examples, the drifting mist of the whiter tones adding immeasurably to the impact. Shouyan sheng was a name used by Wang Zuguang (1847 -- ? ; 1871 jinshi), a native of Daxing (now part of Beijing) who published a number of works of poetry and seal inscriptions. In 1892, he composed the text for a stele in the Hangzhou Confucian temple commemorating a father and son who committed suicide after failing to prevent the Taipings from taking Hangzhou; he identifies himself as belonging to the Coastal Defense Circuit for Hangzhou, Jiaxing, and Huzhou (Du and Xu 2008, pp. 130 – 131). On 17 September 1896 (Guangxu 22/8/kueiyou), the Veritable Records of the dynasty record the fact that he made a presentation to the court and identify him with that same circuit. Thus, at least from 1892 through 1896, Wang was an official in the area where Zhou Honglai was working. 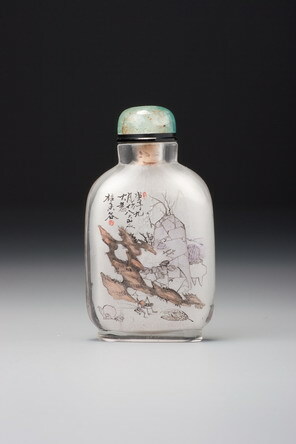 Wang Zuguang’s inscription on this bottle is about snuff. The first four lines are four characters each; the next three are six, and the last is seven. Read in Mandarin, the rhyme scheme could be ababxbbb if one allows ‘nose’ (in the second tone) to rhyme with all the other line endings in the fourth tone. The only poetic form in which we would expect such liberties would be the qu, or ‘aria’, which emerged in the Yuan dynasty (as the language we call Mandarin was coming into being) and continued to be written in the Ming and Qing dynasties. We shall not take the time on this occasion to verify that the inscription follows one of the metrical matrices for the qu (there are many). One gets the key to the organs. It is unlike the fumes of a censer. It is as addictive as tea and wine. If you would maintain your purity, then cover your noses together. Wang finished a book called the Shanghan leijing, ‘Classified canon of cold-related disorders’, in 1894. If we ever run across a copy (it seems to exist only in manuscript and a handwritten copy thereof), we shall see what he has to say about snuff.